We are pleased to announce we have brought back the salt blend with pure pool salt and the special mineral fortified Himalayan Pink salt. Himalayan Salt is quite different from salt found anywhere on the planet, it has a pinkish tint and is rich in nutrients and minerals. Pink Himalayan Salt re-mineralizes the body with minerals and trace elements essential to our health and well-being. Himalayan Salt is harvested from the heart of the Himalayan Mountains. Formed over the last 250 million years, it is considered the purest salt in the world as it is virtually free of pollutants and toxins. For thousands of years, the salt has been used as a main ingredient in baths, body scrubs, even food and drink! Himalayan Salt is reported to contain 84 elements that naturally occur in the ocean as well as in our bodies. 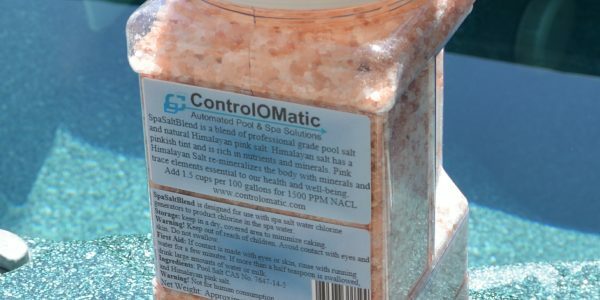 Our package contains 7 pounds of the salt blend which is enough for a 450 gallon spa. can I order this? Or is there somewhere else I can find this? thx! It is on our website, http://www.controlomatic.com. Select Shop, Chlorine Generators, Chemicals and Select Spa Salt Blend. Do you ship to Toronto , Ontario? We can but shipping will be expensive. Better to just use pool salt and if you want some Himalayan salt you can probably get it at a cooking store. Hi, we have just installed the SmarterSpa to our hot tub – firstly the water feels amazing compared to past bromine, our skin feels tremendous! Can you advise if its ok to use Dead sea salt? We bought the Minera brand that states compatible with spas. You can use Dead sea salt, just start off low. There are a lot of minerals so you may need to increase the power level to get the amount of chlorine you need.